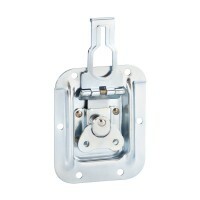 We have an extensive range of OVERLATCH CATCHES to suit every requirement with large stock levels for speedy despatch. Large Overlatch Butterfly Latch in 14 mm Deep Dish Large overlatching butterfly cat..
Small overlatching butterfly catch in dish. Heavy Duty Version. Steel, zinc plate..